It's a blue beauty. It's also night, theme day so why no link madame? Um. Keeping this too yourself is plain naughty. Nice NIGHT photo - looks very quiet and peaceful that little boat! Beautiful with the blue water. You should frame this one! Beautiful blues. Blue on a blue. A lovely shot. You got such saturated colors, how gorgeous! With mostly black night shots, this photo is really outstanding. And amazing how the black turns into blue. I've gone through 75% of the nighttime photos and this one so far is my favorite. Simple, yet very eye catching. Beautiful photo Rosie. 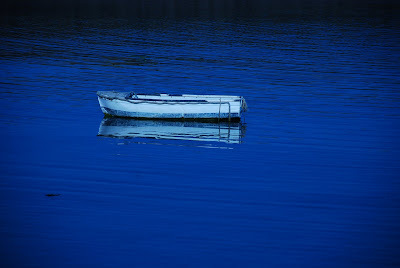 Nighttime photos do such a wonderful job of highlighting blues .. only natural to look for a boat in all that blue .. happy theme day. Amazing the amount of light there is in the dark, yes! I like the blue/black of this and the intense stillness. Rose, I must echo Babooshka's comment. Lovely image! Totally beautiful! and a very unique TD entry. I can look at it for a long, long time. Love this quietly beautiful image. I'm absolutely crazy fore Canterbury and you blog allows me to be there everyday. Thank you. Great colors. Very nice photo -- it's so peaceful. why did you stop photo blogging?!? I enjoyed your post. wow! what a shot! just awesome!